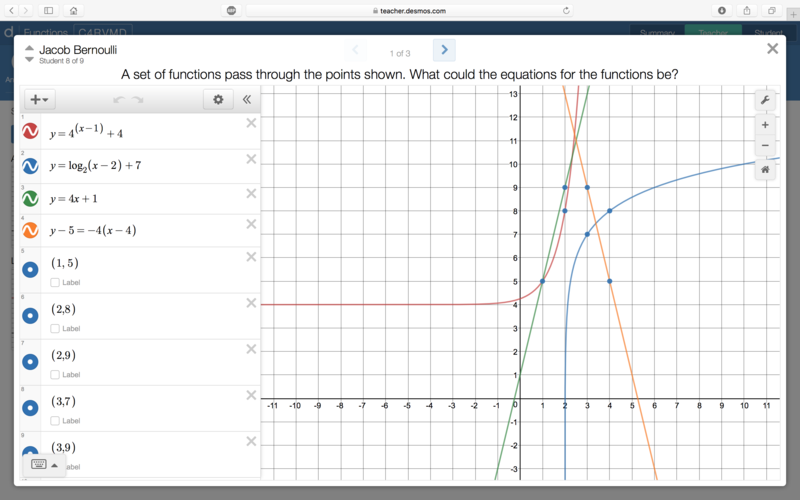 Determine an equation of a quadratic function with vertex at (-5, 3), passing through the point (-7, 15). Lately I’ve been looking for activities that address this sort of naked math yet engage learners in processes similar to those in a mathematical modelling cycle. 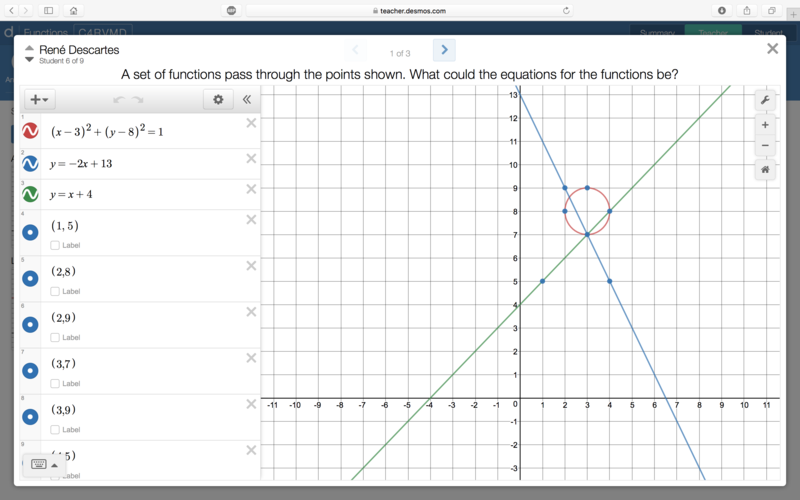 I like this as a blank-page (or whiteboard) activity but a Desmos activity (1, 2, 3) does provide the opportunity to talk about some interesting overlays. If using vertical non-permanent surfaces (#VNPS), I’d stop partway through to hold a “board meeting” where students would share possible parabolas. In general, I progressed from providing more general to more specific clues. 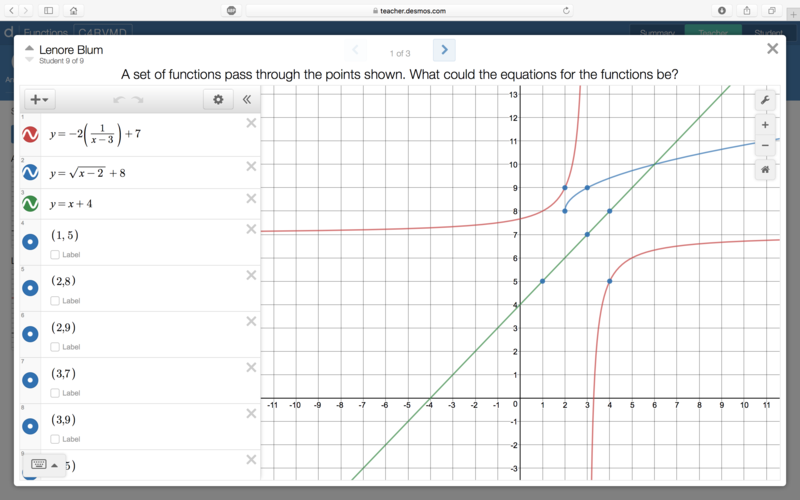 For example, “vertex in QII” divulges p < 0 before “axis of symmetry x = -5″ gives away p = -5. Most clues add new information and move students closer to the Wanted Parabola. Some confirm earlier decisions. For example, “vertex (-5, 3)” before “axis of symmetry x = -5″ and “minimum value of 3.” This last clue is anticlimactic. An earlier clue, “never enters QIII,” is much more interesting. It might feel like new information. But it must be true given preceding clues; a parabola that opens up and has no x-intercepts cannot contain points in QIII (or QIV). Here, the direction of opening clue is revealed midway through the set. It doesn’t add new information but is reasoned to through “two x-intercepts” and “vertex in QI.” I meant to delay students determining the direction of opening a bit, hoping to surprise them after a few clues. In a third Wanted Parabola, “passes through” is the first clue; I anticipate that some students will place the vertex at this point. 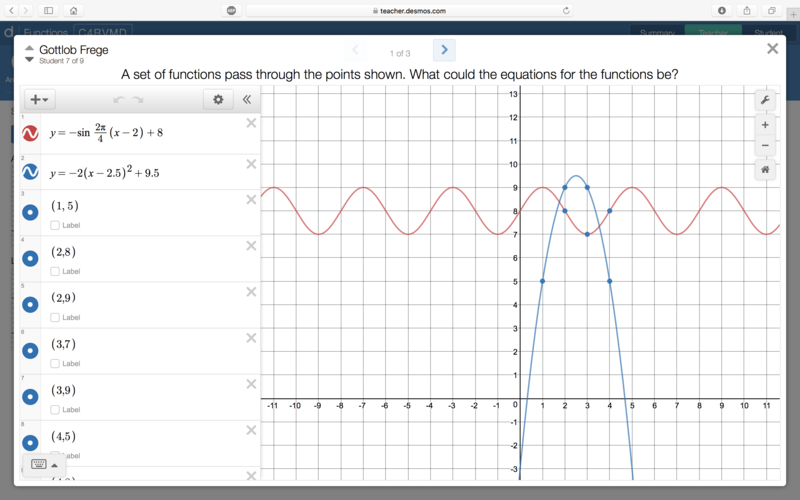 This activity helps students develop an understanding of the different attributes parabolas can have. It provides an opportunity for students to solve problems, reason, explain, justify, and connect mathematical ideas in ways that “Determine an equation…” does not. Marks Krpan, Cathy (2013). Math expressions: developing student thinking and problem solving through communication. Toronto, ON: Pearson Canada. Keira, Grade 4, asked me to show her “the nines trick” one morning last week before school. I did not show my daughter this trick. I am not the Finger Man. It’s like she doesn’t even know me! Instead, we had a quick conversation. No time for manipulatives. Five minutes to brush her hair and pack her lunch before we had to hop in the car. Me: You remember what a ten-frame looks like? Keira: Yeah. Ten dots. Five and five. Array! Me: Ok, what about nine? What does it look like? Me: What if there were two nines? How many? Keira: Don’t ask me that one. I already know it’s eighteen. Me: Ha! Ok, what about seven times nine? Keira: I knew that you were going to ask me that one! Me: What if you had seven ten-frames, each with nine dots? How many dots altogether? Keira: You start with seventy but you take seven away. We did a few more together. Success! Then she asked me to show her the nines trick. I thought that this would make a great “Would You Rather…?” math task. I considered a few approaches. My preference is probably to just display the offer and have students make up their own prices and riff on “What if…?” That might be a tall order. I created a few combinations. (More on these in a sec.) But I wanted something more open. The idea is that students would mix & match specific combinations of board games to justify their decisions. For example, consider Carcassonne ($43) and Blokus ($40). With “buy one, get a second 25% off” the discount is $10 (25% of $40). Add Othello ($35) and with “buy two, get a third 50% off” the discount is $17.50 (50% of $35). It looks like the second option is the clear winner. But if we think about the (total) percent discounts, we get about 12% ($10/$83) and 15% ($17.50/$118), respectively. Proportionally, the gap shrinks. What if we replace Othello above with Spot it! ($20)? Again, the discount is $10 (50% of $20). But it’s not a tie. Saving $10 on $83 is better than saving $10 on $103 (about 12% vs. 10%). There are a couple of combinations where we can’t justify the second option. For example, consider Catan ($63) and Pandemic ($60). With “buy one, get a second 25% off” the discount is $15. Add Rock Paper Scissors ($6) and with “buy two, get a third 50% off” the discount sinks to $3. Beyond making and justifying a decision using mathematics, I’d push students to generalize: When would you rather…? “Dad, stop taking photos of arrays! Are these like the paint splatter thing?” Yep. Partially covered arrays in the wild. Lack of fraction sense aside, it’s nice to know that she’s paying attention. And making connections. ¹BTW, I use Microsoft Office Lens to quickly crop, clean up, and colour these photos on the fly. An essential app for teachers using vertical non-permanent surfaces (#VNPS on twitter). Check it out. At that moment, three students jumped to their feet and cheered. High fives may have even been shared. I asked them what was up. They asked if we could talk about it later. (Never press here, by the way. Rookie mistake. If kids give you an out, take it.) So we did. Each student had estimated how many times I would say “Okay, so, um…” during the lesson. Their earlier excitement? I hit the highest of the three estimates. I had completely forgotten about this episode until last spring when Canucks rookie Brock Boeser’s first ever NHL postgame interview made it into my Twitter timeline. At that time, I was helping teachers make sense of the Ministry of Education’s (MoE’s) “Process for Solving Numeracy Tasks” (a/k/a a mathematical modelling cycle). This post is a collision between the two. The Interpret process in this mathematical modelling cycle involves reading contextualized situations in order to identify real-world problems. I noticed the sports clichés (NSFW). Brock Boeser’s “I just want to come here and help the team get a win” is damn close to “Nuke” Laloosh’s “I’m just happy to be here, hope I can help the ball club.” I also noticed that Boeser says “you know.” A lot. I wasn’t alone. From here, we can develop a real-world problem by asking “What do you wonder?” or “What’s the first question that comes to mind?” My question: How many times does Brock Boeser say “you know” in the postgame interview? Note: the starting point — in the diagram and in the video — is a situation, not a problem. 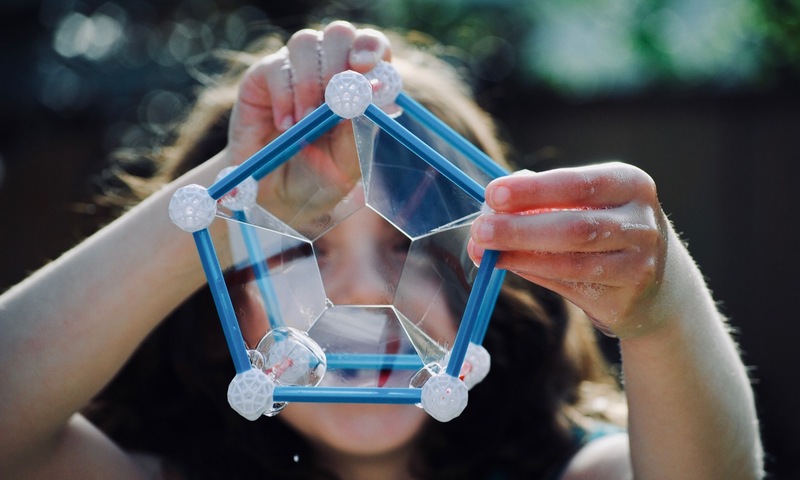 The next process involves identifying and activating mathematical understanding in order to translate real-world problems into mathematical problems. The MoE calls this Apply, a misused and abused term in mathematics education. Thankfully, Mathematize immediately follows in brackets throughout the documents. This process also involves — among other things — creating relationships to represent the real-world problems. Here, a proportional relationship. A simple approach might involve setting up 12/44 = x/178. A math problem. At first glance, this looks trivial: simply cross-multiply and divide. But the Solve process involves using a variety of approaches and representations. For example, students might use scale factors or unit rates; bar models or ratio tables. Or, not proportions, but linear relations. Tables, equations, graphs. Does the solution make mathematical sense? Does the mathematical solution (x = 48.545454…) make sense within the contextualized situation? The Analyze process involves identifying possible limitations and improvements. Brock Boeser says “you know” 12 times in the 44 second Act 2 video. But he reaches this count at 33 seconds and finishes answering the reporter’s question at 40 seconds. Does any of this matter? Is my simple proportional approach still useful? Students communicate throughout the Interpret, Mathematize, Solve, and Analyze processes. This communication happens within their groups. The Communicate process in this mathematical modelling cycle involves clearly and logically defending, explaining, and presenting their thinking and solutions outside of their groups. There are better tasks that I could have picked to illustrate this mathematical modelling cycle. In fact, last year — in the absence of sample numeracy tasks from the MoE — my go-to here was Michael Fenton’s Charge. BC’s Graduation Numeracy Assessment aside, mathematical modelling with three-act math tasks (and the pedagogy around these tasks) has played an important role in my work with Surrey math teachers for several years. The MoE did release a sample numeracy assessment in late September; I am now able to include a Reasoned Estimates, Plan and Design, Fair Share, and Model task in these conversations with colleagues. For more numeracy tasks, see Peter Liljedahl’s site. Okay, so, um, if I didn’t pick this Brock Boeser task because it, you know, epitomizes the mathematical modelling cycle, then why did I share it? Coming full circle to the story of my three students at the beginning of this post, there’s a missing piece. Yeah, we shared a laugh and I was more self-conscious of my verbal fillers for the rest of the year (2005 ± 3). But the most embarrassing part is that I have no idea how my students came up with their estimates. Because I didn’t ask. I mean, three girls spontaneously engaged in mathematical modelling — I promise there was more mathematical thinking here than in the task at hand — and not a single question from their math teacher! In my defence, it would be several years before mathematical modelling was on my radar — an unknown unknown. Still, what a complete lack of curiosity! I probably painted myself into a corner. Adding a fourth shape/graph/number/etc. to a set often knocks down the reason why one of the other three doesn’t belong. Not all two-by-two arrays make good WODB? sets (i.e., a mathematical property that sets each element apart). Last spring, Marc and I offered a series of workshops on instructional routines. “Alike and Different: Which One Doesn’t Belong? and More” was one of them. WODB? was a big part of this but the bigger theme was same and different (and justifying, communicating, arguing, etc.). For more, see Brian Bushart’s Same or Different?, another single-serving #MTBoS (“Math-Twitter-Blog-o-Sphere”) site. Another question that I like — from Marian Small — is “Which two __________ are most alike?” I like it because the focus is on sameness and, like WODB?, students must make and defend a decision. Also, this “solves” my painted-into-a-corner problem; there are three, not six, relationships between elements to consider. The numbers in the left and right images are less than 100 (if a dot is 1); the numbers in the centre and right can be expressed with 3 in the tens place; the left and centre image can both represent 43, depending on how we define 1. At first glance, the second and third are most alike: because decimals. But the quotient in both the first and second is 20; in fact, if we multiply both 6 and 0.3 by 10 in the second, we get the first. The first and third involve a partitive (or sharing) interpretation of division¹: 3 groups, not groups of 3. I created a few more of these in the style of Brian’s Same or Different?, including several variations on 5 − 2. Note: this doesn’t work in classrooms where the focus is on “just invert and multiply” (or butterflies or “keep-change-change” or…). And I still have no idea what I was going for with the Cuisenaire rods. ¹Likely. Context can determine meaning. My claim here is that for each of these two purposefully crafted combinations of naked numbers, division as sharing is the more intuitive meaning. Update: An edited version of this post appeared in Vector. In Steve Wyborney’s Splat!, the total number of dots is given and the number of dots under each splat is unknown. In my Paint Splatter Arrays, the total number of dots is unknown. My paint splatters do cover some dots but how many is beside the point. Also, Steve’s dots are scattered; mine are arranged in arrays. (More on that below.) Steve’s splats splat. My splatters are there from the get-go. See? Not the same. Not all students. Most students do see and use groups or arrays to figure out how many. Those strategies are described in this post. But some students don’t seem to make sense of others’ ideas. That’s a greater challenge than I’ll tackle here. (Recommended: Intentional Talk by Elham Kazemi and Allison Hintz.) Instead, I designed the activity above to (gently) shove students towards looking for and making use of arrays. Students can still see each dot and count all by ones or twos. But a more efficient strategy is to see 3 × 5 (3 rows, 5 columns). I had some fun with the last two. In the next-to-last one, the middle column is completely concealed. In the last one, most of the dots are hidden. A bit of estimation. How many? I test-drove these on my daughters. (Keira likes Booger Math! over Paint Splatter Arrays, by the way. It is catchier.) I’m looking forward to trying this out in Surrey classrooms. Feedback welcome! And mine goes ding ding ding di di ding ding DING ding ding ding di di ding ding. I bought a ham. It was touch-and-go there for awhile. As I was picking up and putting down hams of various sizes, I was calculating baking times. My essential question was, can I have this on the table by six? Simultaneously, I was trying to remember if this was partitive or quotative division. Kilograms, not pounds. I could have converted from kilograms to pounds by doubling then adding ten percent of that. Instead, I divided 1.214 by 0.454. I know, I know, this still gives me the weight of my ham in pounds. But at the time, I interpreted 2.67 as the number of repeated additions of 15 minutes in my baking time. Either way, I determined how many 0.454s there are in 1.214. Quotative division. By a decimal. As a math task, this is clunky. The picture book How Much Does a Ladybug Weigh? by Alison Limentani is a more promising jumping off point for quotative division in the classroom. On each page, the weight of one animal is expressed in terms of a smaller animal. Using the data at the back of the book, we have 3.2 ÷ 0.53 = 6. We could ask children to make other comparisons (e.g., how many grasshoppers weigh the same as one garden snail?). It’s not intuitive–at least to me–to think of 1/3 in 12 ÷ 1/3 as the number of groups. Take a step back and think about 26 ÷ 1 = 26. The cost, $26, is shared between 1 rack of ribs; the quotient represents the unit price, $26/rack, if the unit is a rack. This result should be… underwhelming. Before we think about dividing by a fraction here, let’s imagine dividing by a whole number (not equal to one). What if I paid $72 for 3 racks? (Don’t look for these numbers in the photo above–I’m making them up.) In 72 ÷ 3 = 24, the cost, $72, is shared between the number of racks, 3; again, the quotient represents the unit price, $24/rack. Partitive division. So what about 12 ÷ 1/3? The cost is still distributed across the number of racks; once again, the quotient represents the unit price, $36/(full) rack. The underlying relationship between dividend, divisor, and quotient hasn’t changed because of a fraction; the fundamental meaning (partitive division) remains the same. We could have solved this problem by asking a parallel question, how many 1/3s in 12? And this quotative interpretation makes sense with naked numbers. But it falls apart in this context–how many 1/3 racks in 12 dollars? Units, man! If dollars were racks, a quotative interpretation would make sense–how many 1/3 racks in 12 full racks? As a math task, this, too, is clunky. My favourite math tasks for partitive division by fractions are still Andrew Stadel’s estimation jams. The “Numeracy Helping Teacher” part of my job immerses me in things related to the teaching and learning of mathematics. I’m comfortable in that space. The “Curriculum, Innovation, and Priority Practices Helping Teacher (Guildford/Fleetwood)” part of my job? Not always. It can be challenging to plan experiences that will be meaningful to English teachers and physical education teachers, to science teachers and French teachers, etc. One approach is to have teachers participate in a math activity, then wave my hands–magic!–and say “Of course, this strategy translates to your social studies classroom.” In fact, swap the two subjects in the previous sentence and you will accurately sum up much of my professional development experiences from early in my career. Turnabout is fair play? A more promising approach is to find a colleague from another subject and talk pedagogy. Discuss similarities. Discuss differences. Several years ago, my literacy colleague Iain Fisher hipped me to The New York Times‘ “What’s Going On in This Picture?” feature. An evocative image is stripped of its caption and students discuss/write about what they see. Later, the photo’s caption and story are revealed. A child jumps on the waste products that are used to make poultry feed as she plays in a tannery at Hazaribagh in Dhaka, Bangladesh on Oct. 9, 2012. Luxury leather goods sold across the world are produced in a slum area of Bangladesh’s capital where workers, including children, are exposed to hazardous chemicals and often injured in horrific accidents, according to a study released on Oct. 9. None of the tanneries, packed cheek-by-jowl into Dhaka’s Hazaribagh neighborhood, treat their waste water, which contains animal flesh, sulphuric acid, chromium and lead, leaving it to spew into open gutters and eventually the city’s main river. I needed the activity before the first “WGOITGraph?” would be published so I created my own. I modelled the strategy using Dan Meyer’s “Canada Flushed” graph. Only I stripped it naked. what’s causing the peaks and valleys? I added a critical piece of information: “February… 2010.” That was enough for some to blurt out “Olympics!” or “Hockey!” I gave them time to talk at their tables. There was a natural transition to “What’s going on?” before I asked the question (just as there’s a natural transition from noticings to wonderings). You can read the graph’s story here. It is key that participants notice the line as it implies two variables (that are largely similar). If what’s going on is just a measure of the healthiness of foods, a continuum (a.k.a. a number line) is all that is needed. A coordinate system is overkill. There were some related false starts here (e.g., fat, sugar). I encouraged facilitators to let that play out. Groups self-corrected. The arrows indicate where text boxes have been removed. Learners were told that they could choose to revisit the “stories” of these foods later. Facilitators gradually provided answers to their group’s questions. For example, if participants were told that the y-axis represents the percent of nutritionists saying a food is healthy, they reasoned that the x-axis represents another group: the public (or all Americans). Groups revisited granola bars and quinoa. They discussed possible reasons for differences in opinions between nutritionists and the public. They noticed and wondered some more. When planning, I considered slowly providing this information in a series of slides. To learn more about this approach, see Brian’s post. On Monday, I was invited to Fraser Heights Secondary to be part of their professional development day. I chose to lead teachers through this activity. (Last week, I test drove it with Surrey Math Department Heads.) Teachers–from all departments–were engaged in the activity. Not because of the “real-world” context but because “we had to figure out what was going on.” A math activity. My plan was to connect this activity to core and curricular competencies. Also, I wanted to ask teachers to consider where–in their discipline, in their practice–they could remove (and gradually provide) information. I wanted to ask teachers to consider where they could ask their students “What do you notice? What do you wonder? What’s going on?” I rushed that. “Never skip the close!” I hope that challenge didn’t come across as hand-waving.